"With humor and warmth, Ridker explores the meaning of family and its inevitable baggage. The Altruists may not paint the prettiest picture, but it's a relatable, unforgettable view of regular people making mistakes and somehow finding their way back to each other." --People magazine's "Book of the Week" "Super brilliant, super funny." --Gary Shteyngart, author of Super Sad True Love Story and Lake Success Named a Most Anticipated Book of 2019 by The Millions and PureWow A vibrant and perceptive novel about a father's plot to win back his children's inheritance Arthur Alter is in trouble. A middling professor at a Midwestern college, he can't afford his mortgage, he's exasperated his much-younger girlfriend, and his kids won't speak to him. And then there's the money--the small fortune his late wife, Francine, kept secret, which she bequeathed directly to his children. Those children are Ethan, an anxious recluse living off his mother's money on a choice plot of Brooklyn real estate, and Maggie, a would-be do-gooder trying to fashion herself a noble life of self-imposed poverty. On the verge of losing the family home, Arthur invites his children back to St. Louis under the guise of a reconciliation. But in doing so, he unwittingly unleashes a Pandora's box of age-old resentments and long-buried memories--memories that orbit Francine, the matriarch whose life may hold the key to keeping them together. 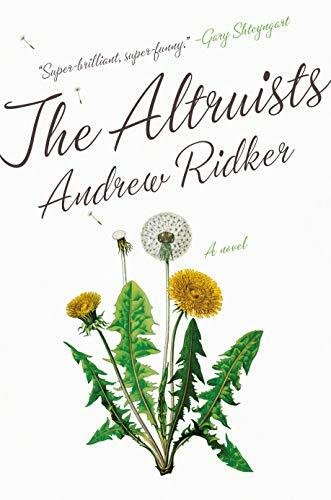 Spanning New York, Paris, Boston, St. Louis, and a small desert outpost in Zimbabwe, The Altruists is a darkly funny (and ultimately tender) family saga that confronts the divide between baby boomers and their millennial offspring. It's a novel about money, privilege, politics, campus culture, dating, talk therapy, rural sanitation, infidelity, kink, the American beer industry, and what it means to be a "good person."